Welcome to a new follower Bargain Hunting Treasure Seeker. Busy day today. Found a few pictures on my 'other camera' taken last weekend. It is amazing how useful I am finding the painted welsh dresser for photos. Still trying to get a 'true color' in photos. I did have some fun with vignettes. The vanilla candle is from my dear Sister, paired with a flask from Grandpa Karl (honorary) and a vintage dark glazed with roses plate. That little group is a 'keeper group". 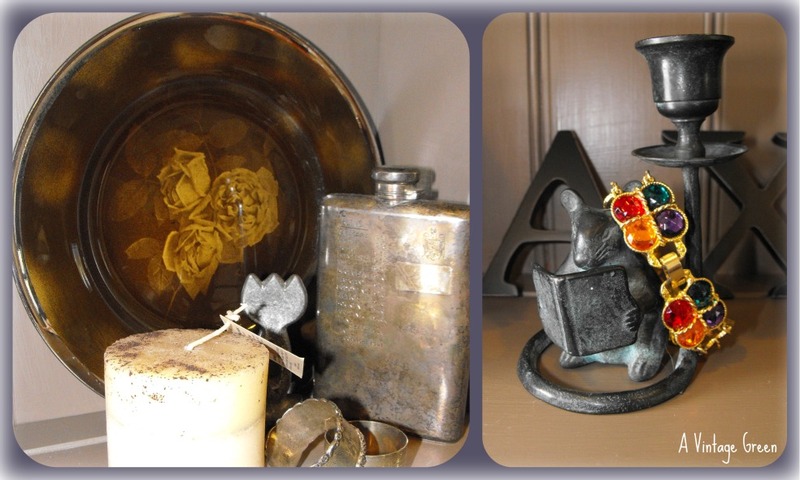 Cast metal mouse reading a book candle holder and a faux everything bracelet, just fun. Already in the mall (actually went in this week and already sold). 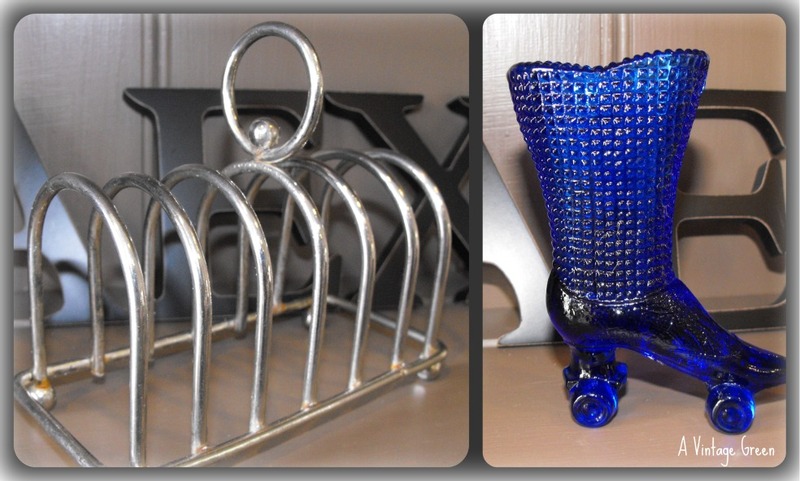 Middle photo - a toast rack (letter holder, post card display ...) and a blue glass boot with wheels (roller skate). Useful, pretty. Took these two to the mall as well. Final photo - white brain coral. This has moved around the house from display to shelf to storage and out again. Its now in my booth. Hi! Thanks for stopping by my blog! I'm glad to have found yours too! I LOVE the roller skate vase! I have never seen anything like it before, and I just LOVE to see or learn about new things! Fun finds and don't you just love it when stuff sells right away!? Thanks for your kind comments. Look forward to reading your next blogs. That coral is really interesting! Pretty pics and love the blog! Yeah you!